dancing, laughter & good red wine: Free-Speech Groupie! Today, I was an unashamed, full-fledged groupie! 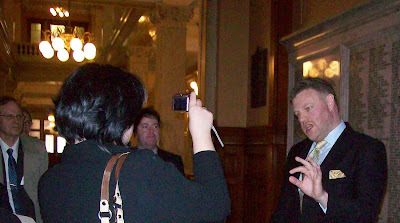 I went to the Ontario Legislative Building to hear Mark Steyn present at the agency review of the Human Rights Tribunal of Ontario. This building is right across the street from my workplace, and I was thrilled that I could attend so easily! Having gotten there just in time for Mr. Steyn's presentation and having secured a seat right across the aisle from him, I seized the moment and went over and shook his hand, quickly introducing myself as a fan, then immediately seated myself and waited for the proceedings to begin. I also recognized Kathy Shaidle (Five Feet of Fury) sitting two rows in front of me. I was very excited, to say the least. First Mr. Steyn spoke briefly (I started to clap when he finished, but quickly realized that wasn't part of the "protocol"). Then he answered the Standing Committee's questions. He was great - I almost laughed out loud a couple of times over his witty responses. Update: Please read the whole transcript here. When Mr. Steyn was finished and left the room, it seemed like nearly half of those present left the room too, because he was the main reason they'd come. What an inspiration! He was confident, eloquent, and funny - obviously speaking from the strength of his convictions. Continuing in "groupie" mode, I went over and introduced myself to Kathy Shaidle, and was also very pleased to meet Denyse O'Leary, as well as RightGirl! 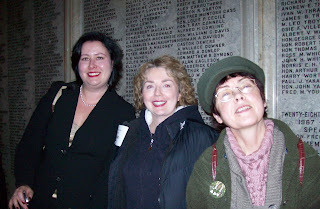 I then did the ultimate "groupie" thing and asked them if I could please take their photo and they very kindly obliged (Here they are from left to right: RightGirl, Kathy Shaidle, Denyse O'Leary). I also took a photo of Mr. Steyn being video-taped by RightGirl (see above). That had to be the most exciting lunch hour I've ever had! I was lamenting the fact that I had to return to work after finally meeting some of my free-speech and blogging heroes. I overheard some talk about them possibly going somewhere for a drink, since "it's five o'clock somewhere", but I don't know if anything came of it, since I had to go back to work. If I hadn't to return to my job, I would most certainly and pathetically have tried to tag along.